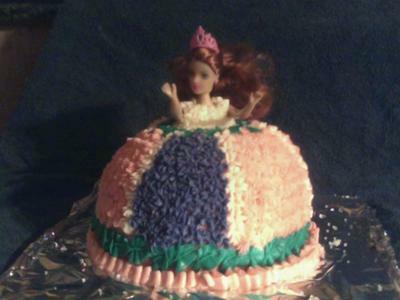 I did not have a doll cake pan to make this Princess Barbie cake, so I used a dome shaped mixing bowl. I took the legs off and wrapped her in plastic. I made the buttercream icing in white, pink and purple the did the alternate areas in star and flower tips and did a leave tip around the bottom of the dress in green buttercream and put clear sprinkles on it. I should have added one more layer so that I would not have to take the legs off,but it was my first time making this cake. I put the legs and shoes in a sandwich bag and gave them to the little girl that the cake was for, so they could be put back on and played with later. This is how I do it. After remove the legs, I put 2 sticks or straws and use some tag to secure them to the body. With these straws the body will sit firmly on the cake.